Acne scars, acne holes… These are but annoying blemishes on face. The acne is gone but the holes and scars are there to stay. Isn’t it really frustrating? Can you really get rid of them? If you consult a dermatologist, you will be asked to undergo treatments and medications. How about if you are on a tight budget? Don’t worry because there are home remedies that can be done to treat acne holes. 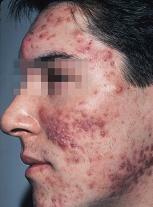 It’s really pretty difficult to cure and get rid of tiny holes and scars left behind by acne or pimples. But try the following remedies. Stay hydrated. Your body and skin need plenty of water so drink and drink. Water is a natural cleansing agent. When your skin is hydrated, excess and dead skin cells are shed off a lot faster. Do not stay long under the sun or if you have to wear sunscreen. Exfoliate your skin with acne holes with an exfoliating scrub. This is helpful in treating scars as it removes the dead layers of skin. Do this twice a week. Apply Aloe Vera on the affected skin. This will make the skin smoother. You can also apply a bleaching cream to the pimple holes to lighten the scars. Apply sandalwood paste treat and get rid of early acne holes, scars, blackheads and whiteheads on nose, and other blemishes on the skin. There are actually different sandalwood face recipes to choose from. Another common way to cure this skin problem is a face mask made out of cucumbers and tomatoes. If these are combined, it can lessen the visibility of pimple scars. Using honey to treat skin blemishes and spots has been popular even in earlier times. Honey mask is proven to be effective really. See your dermatologist for some treatments and medications. You may be asked to apply retinoid creams to stimulate skin cell production. Microdermabrasion is also one of the techniques done in getting rid of acne holes and scars. To prevent getting pimple holes, don’t prick, pop or squeeze your pimples. This will cause further damage. Love your skin and feel beautiful by getting rid of pimple scars and holes.